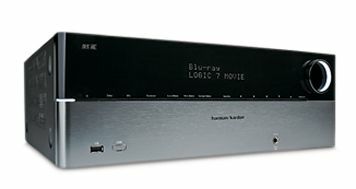 Harman-Kardon AVR 365 review | What Hi-Fi? AV amplifiers aren’t very attractive. Sure, there’s a brawniness and high-tech flashiness that many (including us) find appealing, but genuine style is rare. The Harman Kardon AVR 365 bucks the trend. The two-tone finish, discreet arrangement of buttons and very low number of front-mounted inputs makes for a clean, stylish look. The rear of the device is pared-down, too, omitting connections such as S-Video. Still, most major bases are covered, and while the Harman has fewer HDMI inputs than some rivals, we suspect six will be plenty. Ditto the assignable digital and analogue audio inputs. Some users may well demand a second HDMI output or a full set of pre-outs, however, neither of which appear here. As you’d expect, the AVR 365 has a mic-driven setup that’s quick and simple to use. It doesn’t seem to be entirely accurate, though, in that it classed our surround-back speakers as ‘small’, despite them being exactly the same as the ‘large’ speakers in the rest of the system. This amp is also unusual in that it required manual adjustment to lip-synching. Having said that, manual adjustments are very easy to make, thanks to a clear, quick menu system – so it still won’t be long before you’re enjoying your first movie soundtrack. And enjoy it you will: the AVR 365 has significant get-up-and-go, and its presentation is rousingly brawny and powerful. Big, dynamic effects are despatched with ease, and big explosions such as the one at the hospital in The Dark Knight are so visceral you can almost feel the heat. A general cohesiveness to the surround field makes for a fully enveloping experience, too. However, compared with rivals the Harman does lack some precision, partly in terms of timing (which means effects don’t start and top as cleanly as they could) and placement (which means they’re less identifiable in the surround field). It’s not quite as capable of digging up the finest details, either. At the risk of ending with a list of things the Harman doesn’t do, we feel obliged to point out that while most rivals offer digital iPod connections and substantial network streaming, the Harman requires a separate dock for connecting an Apple portable and can manage only MP3s and WMAs across a network. You do get internet radio, though, and on the Harman it’s a pleasure to use and a lovely listen.